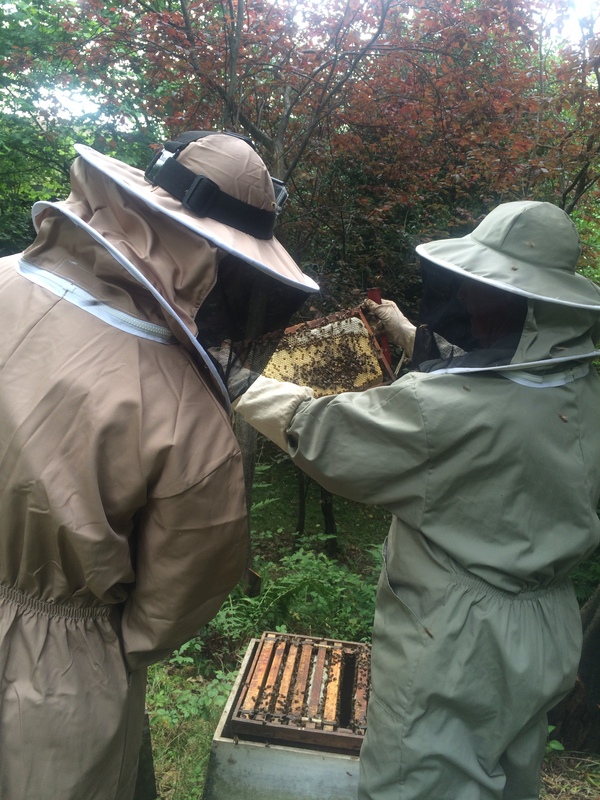 Week 26 of my comfort zone challenge – bee keeping. 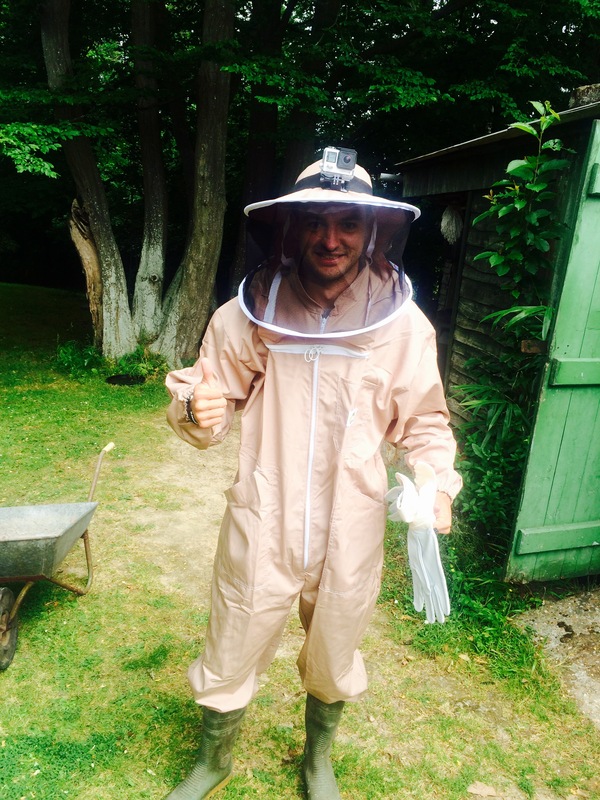 It’s safe to say, I’m not a fan of bees despite the fact I’m told they’re friendly. I hate wasps, bees and hornets. In fact, I can’t really think of any insect that I like. I’d be terrible on I’m a celebrity get me out of here. It was only when my next door neighbour bees decided to swarm into our back garden a few weeks ago, and he came and retrieved them, that I thought what a good idea for a challenge. Obviously, as a bee keeper, my neighbour Richard doesn’t want to disturb the bees too often, so timing of this challenge was the key. Though I’m still not 100% of the process how they make honey… I believe this is how the process goes. The bees collect pollen and nectar and carry it to the beehive. The nectar mixes with the bee’s proteins and converts into honey. They drop of this honey in to a hexagonal comb produced by the bee and repeat until the combs are complete. The bees then cap the honeycomb with wax and move onto an empty cone. It’s all pretty clever stuff from the bees. Richard was telling me, that they are extremely clever creatures, their sense of smell is incredible. They’ll know a bee from their swarm, and any intruder immediately. If you aren’t part of their swarm, you’re out. It’s safe to say, they are protective of their queen. Once we had woken them up, they had no quarms in headbutting Richard and myself constantly. Quite admirable really. The queen spends all of her time in the brood chamber, protected by her group of workers whilst she lays 3,000 odd eggs a day. Amazing, how colonies of insects work really. Workers have one goal, get the pollen in. There wasn’t enough honey to take any of this time, however, Richard has promised I can come back to see the final product when it’s done. The suit was the key for making all this happen, I would have been squirming all over the place without it. It was a fascinating experience, certainly learnt a few things, and Richard was brilliant in teaching me what was going on, despite being a terrible student. My fear of insects still exists despite my fascination in how they live. Week 25 of my comfort zone challenge saw me take the long old journey from London to Brighton, via country roads, on two wheels. 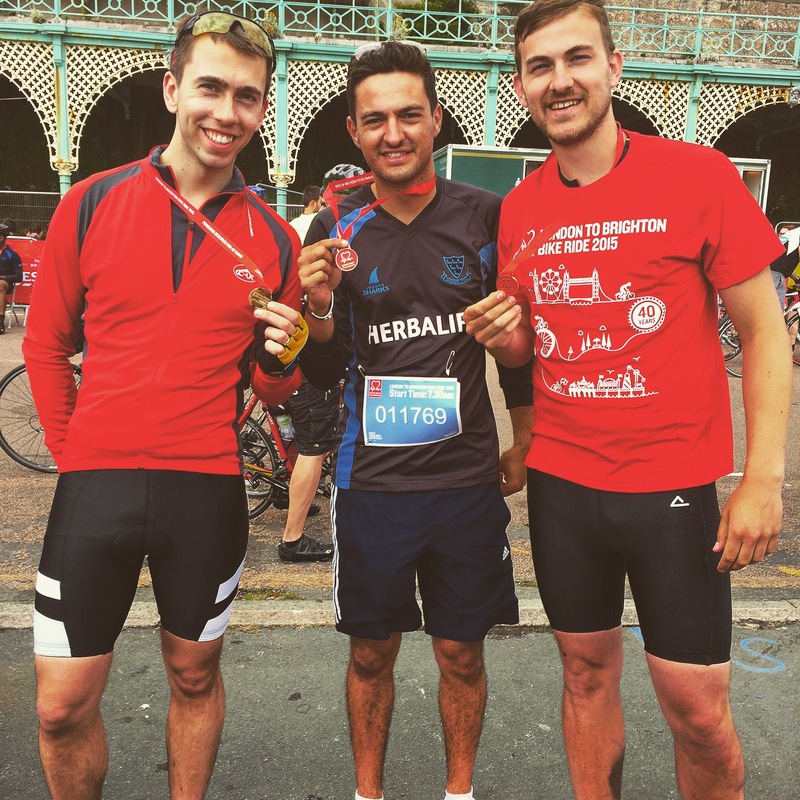 The British Heart Foundation London to Brighton Bike Ride. 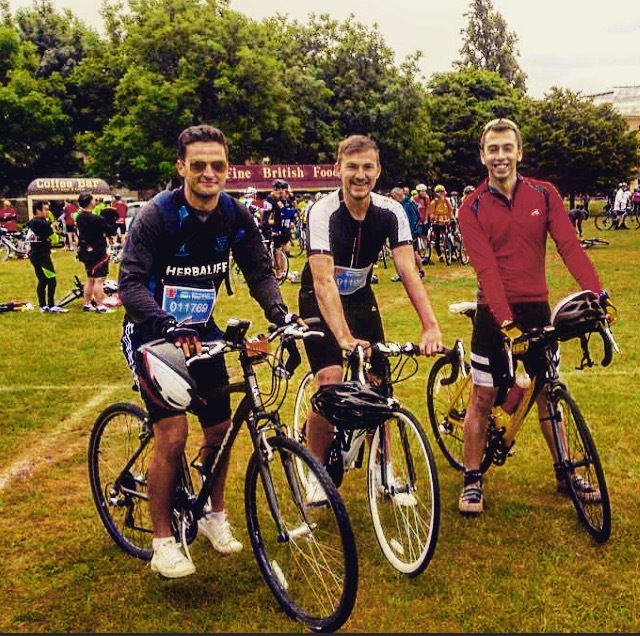 I was joined by 27, 999 other people including Pippa Middleton, as we attempted to ride 55 miles, from the party atmosphere that is ingrained in Clapham all the way to beautiful seaside air along Brighton seafront. For me, this was riding from my 2nd favourite city in the world, to the closest city that I could call home. My preparation for the day was far from ideal, two 18 mile rides without any hills is hardly any preparation for 55 mile journey, that included Ditchling Beacon (more about this later). What I did know though, is that I would complete it, whether it took 3 hours or 3 days. I’ve never been a quitter, and I wasn’t about to start now. My alarm went off at 6.30am, and I forced down a chicken pasta dish, whilst reading what my mates had been getting up to on their night out, just an hour before my alarm went off. We were due to start at 7.30am, but due to the crowds, we eventually got going around 8.15am. The start may have been the biggest anti-climax I’ve even been part of, a big 10 to 1 countdown, followed by the riders having to walk their bike of Clapham Common due to the volume of people. What did make me laugh at the start, were the two drunk guys, obviously having not slept, rocking up with their ‘Boris Bike’ attempting to start the ride. I have no idea if they started, and if indeed they did, how long they lasted. As we rode through London, there was a fantastic atmosphere between the riders, people chatting at lights, people singing and generally great spirits. At this point, we were as fresh as a daisy, and stopping at lights was a good time to chat. My favourite part being, the team dressed as Mexicans riding and singing songs the whole time. At this point, everyone really embraced the three rules of the day set by the organisers… Keep left, keep safe, keep smiling. It was brilliant to ride through the streets of London, so early, and see a side to the city you don’t often see. For the first 15 or so miles, I just took in the atmosphere, slowly get to grip with my bike, try not to get cut up by other riders, and try to avoid myself cutting up any riders. Avoiding other riders was enough to concentrate on in the early stages. That was until we left Carshalton, and the road started to take a steady incline, not deemed as an actual ‘hill’ this incline was enough to make me think my work will be cut out on this ride. Though compared to what was to come later, it was a doddle. Through the middle section of the ride, it was all about rhythm trying not to think about the task ahead, but getting there slowly and surely. I’d say once I’d hit the 30 mile mark, I really hit a wall. Every slight incline was taking it’s tole and Brighton just felt a mile off. We stopped 5 or 6 times, to quickly rehydrate, eat a flap jack, chat how much we hated the previous incline and then go again. 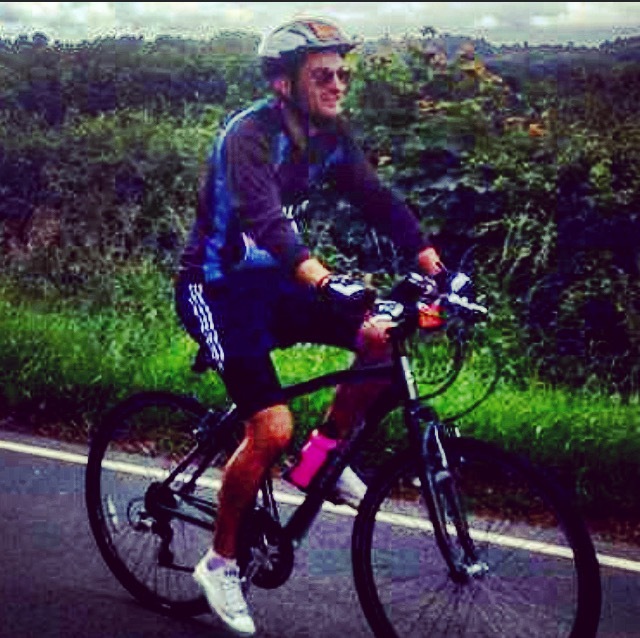 We made it all the way to Turners Hill… And this killed me. Purely, because at what you perceive is the top, there is a bit of a carnival atmosphere, band and people sitting on the village green. It was tempting to stop and have a beer here all afternoon. I briefly spoke to volunteer at the church, who was giving out water, he told me it was 15 miles of all downhill until ‘The Beacon’. He lied. Immediately, we seemed to be on another incline that just felt like it went forever. At this point, I was in the real low gears, and pace was terrible. I had to get in a zone of determination, telling myself this doesn’t beat you. There wasn’t any talking/singing going on at this point. It was just keep going, until ‘The Beacon’. The Beacon – this was like a mythically mountain to me until the day. “Good luck getting up Ditchling Beacon” people would tell me. “Will you beat the Beacon? !” the announcer was shouting at the start. I saw people wearing t-shirts saying “I beat The Beacon”. The chat throughout the whole day, was how long until The Beacon. Even with all this chat and build up, I was surprised at the beast that was ‘The Beacon’. It looked like a mountain as we rode towards it, and the atmosphere just felt more tense. At this point of the ride, my whole body was aching, legs felt like jelly and the last thing I needed was a ridiculous hill. I attempted it, but couldn’t last any longer than a quarter of it. I was so shattered in fact, it was hard work even walking up it. I couldn’t quite believe the people that managed to get up there. I’d say almost three quarters of the people around me had to get off, and the guys that did it, looked like they had ridden before. What an achievement for them though. At the top, crowds of people stopped off for an ice cream and what a view awaited at the top. The beautiful countryside of good old Sussex by the sea awaited and the promise of downhill all the way to Brighton (not a lie this time). The downhill ride, was a great opportunity to get a bit of speed on your face as you knew the hard work was done. As we pedalled into Brighton and the more familiar roads to me, I started to look around, look at all the people on their bikes and the causes they were cycling for on the day, and thought what a brilliant event. I almost didn’t want to get off the bike along the last few miles, my body was so exhausted, I became worried about how bad I was going to feel when I eventually stopped. Though the stopping and starting at the traffic lights in Brighton in the final furlong, was frustrating, the hard work was done and we saw the pier. Here the crowds emerged, and we rode along to the finish line. I managed to spot my family as we rode in, and myself and the boys high fived as we crossed the line at the same time. 55 miles and 6 hours later, we made it. 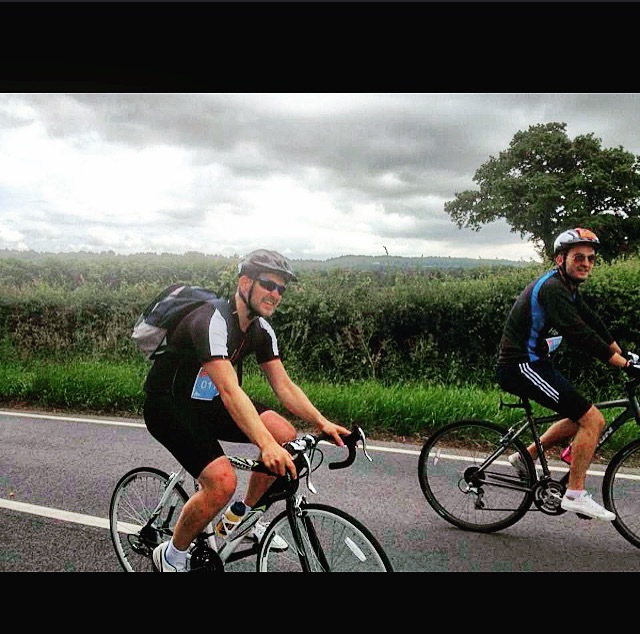 The biggest of shout outs go to Adam and Jon Staplehurst who rode the whole way with me, stopping together and meeting up when we lost each other on The Beacon. A couple of true champions, who certainly made the challenge far easier. Jon made the ride look easy, and having previously conquered The Beacon, the pace of Adam and myself was probably a walk in the park but he’d always wait for us without any complaint. The next shout out, is to all the guys volunteering on the way that made the event brilliant. Words of encouragement, whilst keeping us safe along the 152 Marshall points made the event run extremely smoothly, because believe me, I would have found a way to get lost without them. My final thought for this week, is if you get the chance do this. If I can do it, believe me you can do it. Challenging ourselves is what makes life interesting, and overcoming them is what makes life meaningful. I woke up with a real sense of achievement the day after, and believe everyone else who took part would have felt the same. BELOW IS A VIDEO OF THE EVENT… GETTING 6 HOURS OF FOOTAGE INTO 12 MINUTES IS HARDER THAN IT LOOKS! 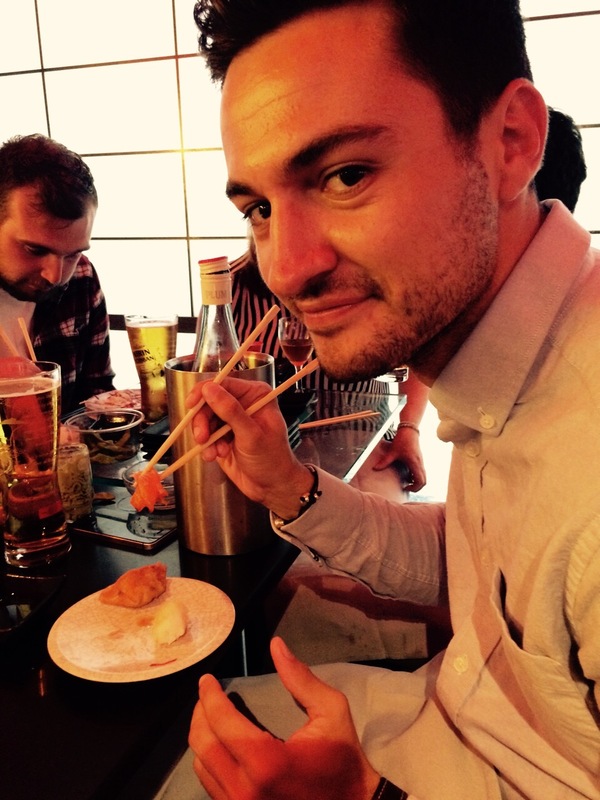 Week 24 of my comfort zone challenge, and this week I tried a bit of the Sushi experience! Madly, I’d never tried this Japanese delight before. You know the only reason I think I hadn’t been before is because the thought of eating raw fish was never really that appetizing. You ask anyone close to me, you’ll know I’m a big meat eater. Any meal, has to have meat in it. Fish, tends to take a real back seat role in my diet because of this. 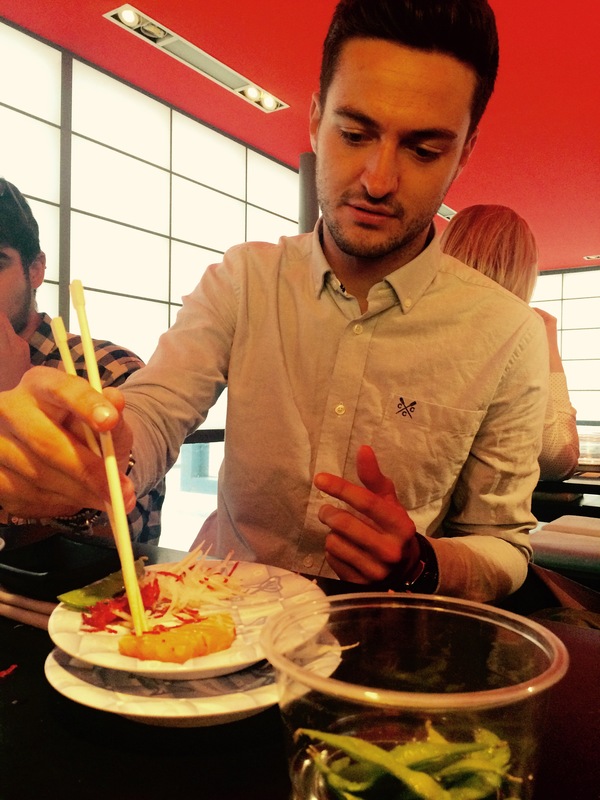 The main issue for me was working out how to use the chopsticks. Something I’ve never been able to do, and still can’t. I had cramp in my hand by the end of the night! 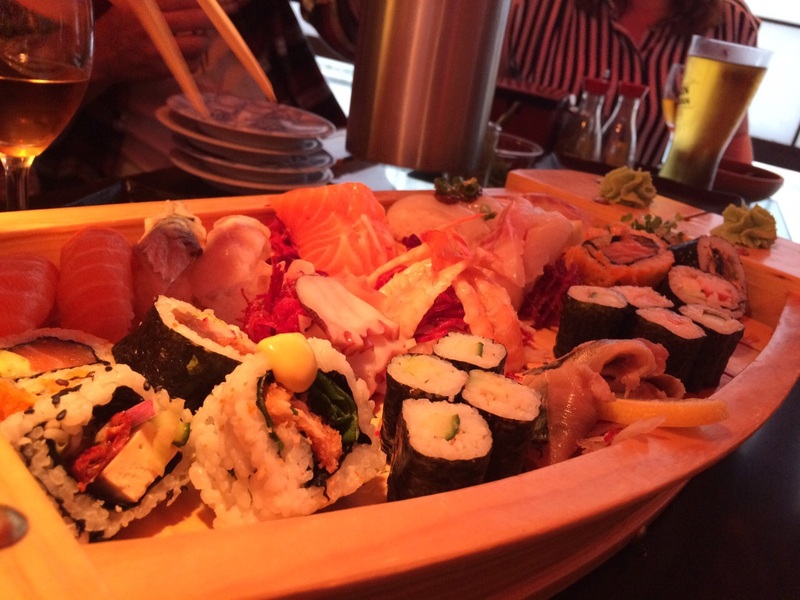 We managed to order a boat, yes a boat, full of the Sushi delights. I couldn’t tell you what was on there, as throughout the night I had no idea what I was eating. . You’d just pick a dish you like the look of from the conveyor belt, and just be charged for the plate. I tried a bit of everything, and on the whole LOVED it all. It was blooming lovely. Puddings were slightly odd, but the fish it self was a different kettle of fish (pun intended). Without feeling like I had eaten much, I soon felt full. Must have been the rice that went with it all. What I loved about it was the relaxed atmosphere in the restaurant. You’d literally sit down, order a drink, pick bits from the conveyor belt, pay and go. So much quicker and easier, than your usual sit down meal. I can see why it’s so popular, and would certainly go again! Not sure if I kept to the etiquette of Sushi goers, and I’m still trying to work out using chopsticks, I’ll get there one day, but I do implore everyone that hasn’t tried Sushi to give it a go! The more normal side of my life involves full time work. It was during work, where I was challenged to do this week’s challenge. I booked Charleston Dancers, Savoy Kicks, for some pre-match entertainment before a T20 match on Sunday afternoon. It was then, my boss and Chief Executive said “There’s a comfort zone challenge for you”. Bugger, I though in my mind, I’ve got to do it. You can see the Savoy Kicks in the video below. As current world champion of worst dancer on the planet, needless to say, this kind of activity is outside my comfort zone. I can make any dance move look awkward. I agreed to come to the hour beginners class, hosted by Elena, who promised me she could teach people of all abilities. She needed to be a good teacher and she was. We started by learning the basic Charleston steps and then proceeded to break the ice by Charleston-ing around the room introducing ourselves to each other. I was one of two men at the class, with the other 15 people being women. I have to say, I found it extremely awkward to begin with. Running across the room doing extravagant, camp dance moves, is not my cup of tea. I never got comfortable with the camp dance moves if I’m honest, I just seemed to stop caring so much by the end of the session. Let’s be honest, I don’t have much face to save anymore. We were taught a quick routine, part of which, was a move called ‘the scarecrow’. I thought to myself at the time, I might call all my dance moves the scarecrow, as they are brilliant for scaring birds. By the end of this, I just started laughing at myself, as I often do with these challenges now. How can I be so bad at dancing? I mean, I’m actually trying hard to be in time, and still mess it up! 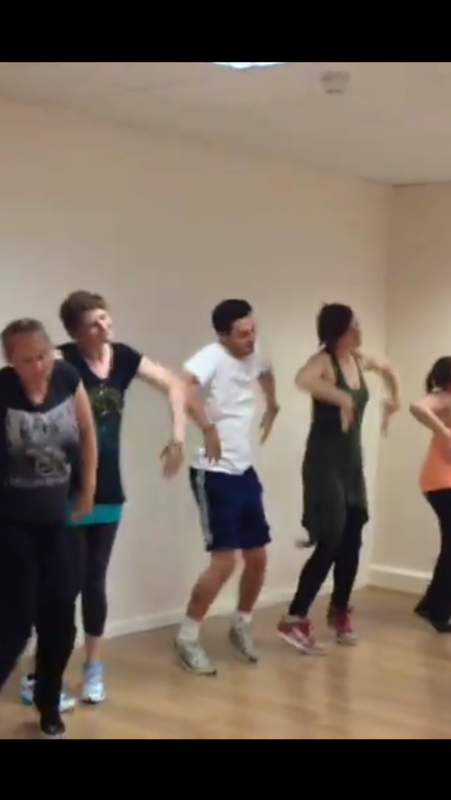 The challenge is still out there for someone to be able to teach me to dance!